Anatoly Krasilnikov, head of the Russian Domestic Agency; Daniela Puttman; Michael Walsh, head of the Diagnostic Division; Francoise Flament, head of the Procurement and Contract Division; ITER Director-General Motojima; and Luciano Bertalot and Robin Barnsley from the Diagnostics Division. The first Procurement Arrangement of 2013 was signed last week at ITER by the head of the Russian Domestic Agency, Anatoly Krasilnikov, and ITER Director-General Osamu Motojima for the divertor neutron flux monitoring system. "This represents a large volume of work that has been carried out by the diagnostics teams in Russia and at the ITER Organization and it is my pleasure to be here and make this signature," said Anatoly. The divertor neutron flux monitoring system, or DNFM for short, is destined to sit at the bottom of the machine in three roughly equally spaced positions around the torus, integrated with the divertor. This monitoring system uses sensors that provide signals, or counts, when hit by the neutrons produced during fusion reactions. "By knowing this neutron emission," says Luciano Bertalot, "fusion power can be estimated, providing very important information regarding ITER performance." The divertor neutron flux monitoring system sitting at the bottom of the torus. Integrated in the divertor, it is designed to provide routine measurements of the neutron emissions. The diagnostic will have to withstand quite a harsh environment: high neutron flux and nuclear load, high temperatures (up to several hundred degrees), magnetic fields (up to 5 Tesla), and significant electromagnetic noise. 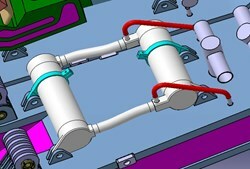 The DNFM will need to be integrated into the divertor modules before they arrive on the ITER site. Since the development of the divertor is well underway, the signing of this Procurement Arrangement is an important milestone in order to maintain the ITER schedule. The divertor neutron flux monitoring system sitting at the bottom of the torus. It is integrated in the divertor and is designed to provide routine measurements of the neutron emissions.